The Dead Come Back To Life! Stella Shows Its Teeth: The Stuttgart premier of Roman Polanski's gothic musical "Dance Of The Vampires" was the scene of delirious celebration as the musical production company is rescued from the brink of bankruptcy. 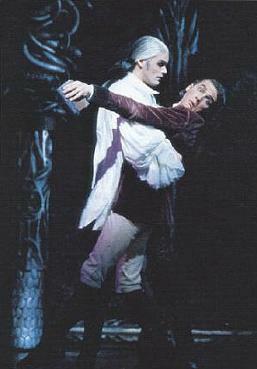 As Count von Krolock, Kevin Tarte radiates in Stuttgart's "Dance Of The Vampires" - outshining even his own predecessor, Steve Barton, star of the original Vienna production. When a young maiden follows the sinister Count through the cobwebbed, ancestral chambers of his castle, a proclamation echoes : "Be Prepared." The Count's words can also be heard as a petition to musical fans urging them to make a pilgrimage to Stuttgart to see "Dance Of The Vampires." Like "The Hunchback Of Notre Dame," "Beauty And The Beast" and others, the story is based on a successful film. In this case, however, over twenty years separate the film and the musical theater version. Roman Polanski's 1967 film and cult classic "Dance Of The Vampires" parodied the dreadful horror movies so common at the time. Yet it wasn't until October 4, 1997, at Vienna's Raimund Theater, that the musical version, directed by the master himself, was first staged. The thriller arrived in Germany last Friday, premiering at Stuttgart's Music Hall. What a premier it was! Apparently musical lovers experience the same urges felt by vampires: they absolutely thirst for novelty, crave the flesh of a fresh melodies and hunger for an infusion of new songs. Just last December, in the very same theater, the musical was pronounced dead when "Miss Saigon" was canceled after a five year run. But this new tale from the crypt has quickly brought the genre back to life, prompting cheers from the balconies, thunderous applause in the orchestra section and standing ovations for the cast of "Vampires." The production had been so well-received in Vienna that it was clearly going to be a guaranteed success. Composer Jim Steinman, whom the LA Times once dubbed the "Richard Wagner Of Rock," has pepped up his songs a little and added an act to the show. Roman Polanski is, once again, in the director's chair. The cast includes four familiar names from the Vienna production, most notably Aris Sas as Alfred (in the role Polanski himself played in the film version). In a way, this wasn't as much a premier as it is was relocation of the show. Let us boldly assume that the story is familiar to most people. Or can it be that you have never heard the horrific but enchanting tale of the absent-minded professor, his scatterbrained assistant, the fair Sarah, and His Sinister Highness with the sharp canines? Interviewed before the premier Polanski said he would not have been interested in doing "Dance Of The Vampires" in the form of a stage play because it wouldn't have given him a chance to do anything differently or to improve on the film. Initially the dialog is kept true to its archetype, except it is sung rather than spoken. 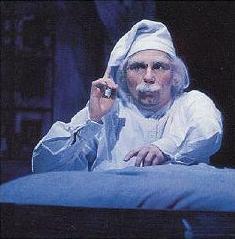 But, the stage version deviates in the second act. 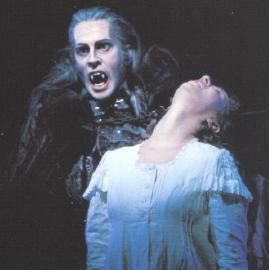 Here Sarah is not kidnapped by the Count, but instead follows him rather willingly and Alfred, the assistant who tries to save her and is pursued by the Count's son (a vampire that prefers to sink his teeth into the necks of men), explores a dream sequence that presents him as not particularly adverse to the chase. While the living - the professor and the Yiddish-speaking innkeeper - behave as comically as they do in the film, Polanski allows his immortal Count to conduct himself far more seriously. In this role, Kevin Tarte not only has the advantage of longer teeth, but also possesses a better voice. Ultimately he is able to turn the tide of sympathy in his direction. What was once a parody has become a moving melodrama, the story of the vampire as a lonely outsider yearning for love. This is also the underlying theme of "Beauty And The Beast," which is currently being produced in Stuttgart across the street at Stella's second theater. Musically, however, there is nothing in common between the two pieces. "Dance Of The Vampires" sounds like a hunting excursion through the history of music. 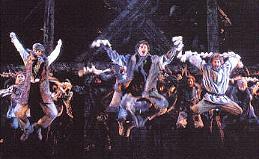 During the first "mortal" act, the music roams amid bubbling Rossiniesque compositions, Gerschwin-like melodies, and songs that might have graced the set of "Fiddler On The Roof." The composer tosses out some truly catchy tunes such as, "Never Seen," "Freedom Is Out There," and "When Love Is Inside You." In contrast, the vault of the vampires reveals itself as a disco cellar where the fare consists of hot rhythms and screaming electric guitars. Here the music undergoes several stylistic detours into symphonic rock, a genre we haven't heard much of lately. Steinman beautifully rewords his hit "Total Eclipse Of The Heart," a song he once wrote for Bonnie Tyler that now serves as a leitmotif capable of prompting the dead to move in their graves; that is, if they hadn't just stepped out of them. Overall, this show does have bite to it. It also puts two afflicted men back on track: Roman Polanski, whose latest film "The Ninth Gate" was less than successful at the box office and, particularly, Peter Schwenkow, whose Deutsche Entertainment AG [German Entertainment Company] took over Stella when it began to flounder in February. Schwenkow confidently stepped onto the stage before the premier and triumphantly announced: "A new era begins today - Stella is back. Go forth and tell the world!" This new musical could easily be seen as an allegory for the company's history. Stella itself had been declared dead and imminent bankruptcy was about to be the final stake through its heart. Yet in the end, Stella has emerged victorious, just as the vampires in "Dance" ultimately prevail and conquer the world. Of course, this interpretation would mean we are comparing Stella with vampires. In any event, Steinman's song entitled "For Sarah" could certainly serve as the company theme song, at least the lines: "I will make it and I will endure/Whatever I must do/I will do/For Sarah, " when substituting the word "Sarah" with "Stella." The team also plans to follow the productions in Vienna and Stuttgart with others. The vampires are scheduled to dance their way through other European cities soon. Above all, the producers have their sights set on Broadway where the gothic musical may appear later this year. It would be the first time a German production of a musical makes the leap across the big pond. Steinman is already looking forward to Broadway although he's not certain how they'll handled Polanski's situation - the director was banned from working in the United States in 1978 after his arrest involving an affair with a 13 year old.